Every major update to Nuke feature big improvement to the Viewer playback performance. Previously, FrameCycler Pro is bundled together in Nuke as a flipbook software although one can configure other flipbook softwares such as JefeCheck or Pdplayer. Although with Nuke 9, The Foundry develop their own flipbook integrated in Nuke which I rarely used as I prefer to rely on the Viewer to double up as my very own flipbook player. I’ll be sharing my own approach in flipbooking a sequence for preview purpose. 1. Just let it cache in the Viewer as you playback the shot. As the title says, you can let it cached as you playback the shot. Works great if you have the RAM to spare and if you need to view the full res render, just enabled Full Frame Processing. Alternatively, I prefer to execute a Write node and read it in to be playback in the Viewer if the part of the script is really heavy to be render quickly. Just execute a background render (for example 2 to 4 threads while you continue working on other part of the comp script. If you want to “playblast” the Viewer, you can do it using the Capture button located to the right of the Flipbook icon. 2. 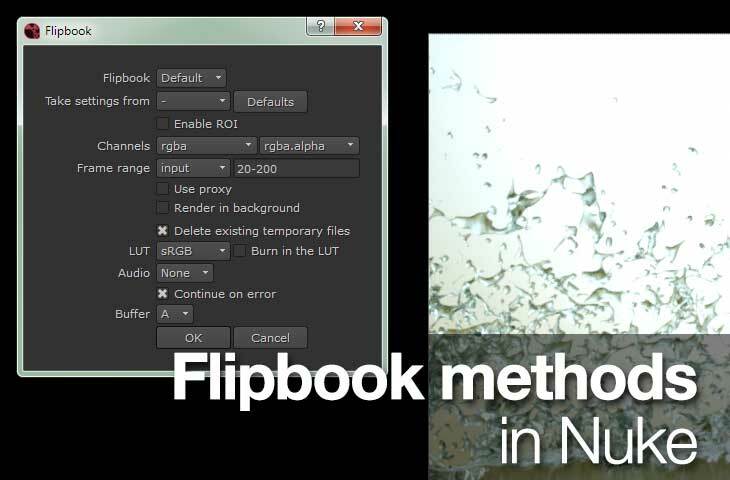 Using Nuke 9 Flipbook command. As seen in the header image, you can invoke the Flipbook command using Ctrl+F on Windows. If you need audio playback support, you’ll need to use this method instead of the viewer. 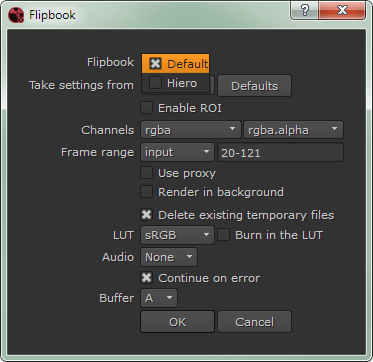 The flipbook in Nuke 9 also supports A/B buffer which I think is absent in prior version. Although I think it is limited to Nuke 9’s flipbook itself. 3. Setting up Nuke to load external flipbook player. Lastly, you can always configure Nuke to load up another flipbook player of your choice. Here’s a good link on setting up JefeCheck in Nuke at Nukepedia. Although be warned that not all settings in the Flipbook window are supported when using external flipbook player.